Backstory: Babymama called last night in a near panic, she, Babydaddy and Babydiva were to leave this morning for a week at Orange Beach, AL and their dogsitter arrangements fell through. Did I mention that this was about 12 hours before their scheduled leaving? No, I didn’t think so. So, Mr. Iknead and I said sure, we’d dogsit Bela, our granddog, no problem, glad to do it and we were. 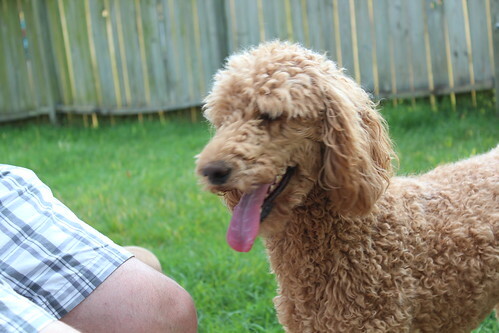 Did I mention that our granddog, Bela, is a standard poodle? No, I didn’t think so. She’s an awesome dog, very smart and very active. Think of having a gazelle in your living room. 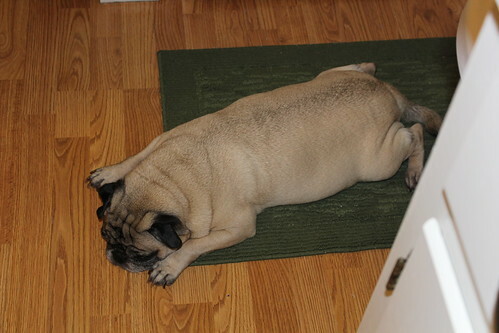 Our pug, Josie, is just about as opposite Bela as you can get and still be considered a canine. If Bela is a gazelle, Josie is a cross between a rhino and a sloth. All was going pretty well, everyone was settling down and Mr. Iknead noticed that Josie was limping on her right back leg. OK, we think, she’s had more exercise in the past hour than she has in probably six months, she’s tired. She’ll be better in the morning. She wasn’t better this morning, was not putting any weight on that leg so, of course, a visit to the vet was in order. Because of this, we had to backtrack, had to hand Bela back off to Babydaddy and Babymama this morning and wait until the vet’s office opened before we called and got the ball rolling. Thankfully, they were able to make alternate plans for Bela and it all worked out, but I felt AWFUL about the whole thing. Awful because we had to renege on dogsitting and awful because Josie was limping around and maybe hurt and not just sore. Long story short: Josie has a right knee ACL tear, probably not complete, only partial and has to be on doggie bedrest for at least two weeks to allow it to heal and avoid a doggy ACL repair. I decided not to mention to the vet that Josie lives her life on doggy bedrest, sleeping on various pieces of furniture and only moving around to go outside to potty and to get to her bowl when it’s time for to be fed. OK, maybe I’m exaggerating a little, but in the summer especially, she moves only when it’s absolutely necessary or if someone in the vicinity is eating. At which point, she gets up to investigate and stare until she’s given a bite. So, our definition of doggy bedrest is lifting her on and off the furniture and the rest of the time, sleeping on a nice soft cushion that Mr. Iknead made for her out of an old sleeping bag with a broken zipper. Hopefully, she has just a small tear or even better, just a sprain and will improve every day with anti-inflammatories and pain meds. Until we know for sure, doggy bedrest it is. I’ll post it tomorrow, for sure.